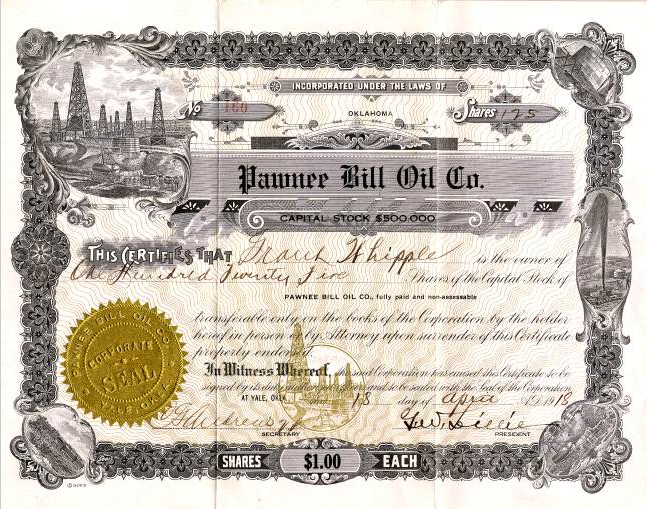 As World War I neared its end in 1918, Gordon William “Pawnee Bill” Lillie entered the oil business in Yale, Oklahoma. Despite not being as famous as his Wyoming friend Col. William F. “Buffalo Bill” Cody, Lillie was a widely known showman and promoter of his state, according to his biographer. The Pawnee Bill Oil Company operated a refinery in Yale, leasing 25 railroad tank cars during World War I. When the end of the war reduced demand for refined petroleum products, his company along with many Oklahoma refineries were soon operating at half capacity – or closed. Although his oil company was still operating in March 1921, Pawnee Bill was forced to shut down his Yale refinery. His friend Col. William Cody’s Shoshone Oil Company had failed about a decade earlier in Wyoming. A circa 1930s service station owner explains why gas costs 20 cents a gallon in this Library of Congress photo. A U.S. state for the first time taxed gasoline in February 1919. Oil was selling for just $2 a barrel when Oregon enacted the one-cent gas tax to be used for road construction and maintenance. Less than two months later, Colorado and New Mexico followed Oregon’s example. Within a decade, every state had added a gas tax of up to three cents per gallon. Faced with $2.1 billion federal deficit, President Herbert Hoover tacked on another one-cent per gallon federal excise tax in 1932. State gasoline taxes and fees in 2018 averaged about 31 cents per gallon, varying from a low of 14.7 cents (Alaska) to a high of 58.7 cents per gallon (Pennsylvania). The federal excise tax on gasoline has remained unchanged since 1993 at 18.4 cents per gallon and 24.4 cents per gallon for diesel fuel. A northern California oil well invested in by former lawman Wyatt Earp was completed with production of 150 barrels of oil a day. His interest in the prolific Kern County oilfields came long after his famous 1881 gunfight at the O.K. Corral in Tombstone, Arizona. At age 75, Earp was just briefly interested in seeking wealth in the oil patch. Members of the Los Angeles Association of Professional Landmen toured THUMS islands operations on November 4, 2017. Photo courtesy LAAPL. Voters at Long Beach, California, approved “controlled exploration and exploitation of the oil and gas reserves” underlying the harbor south of Los Angeles. The city’s charter had prohibited such drilling since a 1956 referendum, but advances in technology offered new and environmentally sensitive opportunities to exploit an additional 6,500 acres of the Wilmington oilfield. Four artificial islands were soon constructed at a cost of $22 million by a consortium of companies called THUMS: Texaco (now Chevron), Humble (now ExxonMobil), Union Oil (now Chevron), Mobil (now ExxonMobil) and Shell Oil. The islands in 1967 were named Grissom, White, Chaffee, and Freemen in honor of lost Nasa astronauts. Occidental Petroleum purchased THUMS in 2000. Today operated by the California Resources Corporation, the four “Astronaut Islands” were designed to blend in with the coastal environment. From shore, they appear to be occupied by upscale condos with landscaped vegetation, courtesy of Disneyland architect Joseph Linesch, whose integration of oil production structures was described by the Los Angeles Times as “part Disney, part Jetsons, part Swiss Family Robinson.” Learn more in THUMS – California’s Hidden Oil Islands. Common man-made fibers used for textiles and plastics contain six carbon atoms per molecule. A former Harvard professor working in a DuPont research laboratory discovered the world’s first synthetic fiber – nylon – a petroleum product. After experimenting with artificial materials for more than six years, professor Wallace Carothers created a long molecule chain, a stretching plastic. The inventor had earlier discovered neoprene (commonly used in wet-suits), advancing understanding of polymers. Just 32 years old, Carothers produced the fibers when he formed a polymer chain using a process to join individual molecules. Each molecule consisted of 100 or more repeating units of carbon, hydrogen and oxygen atoms, strung in a chain. DuPont company patented nylon in 1935, but it was not revealed until 1938. Initially known as “Fiber 66” the new polyamide was one product from DuPont’s 12-years and $27 million in research. A variety of market names were considered for this “artificial silk,” including Norun, Nilon, Nuron, and Nepon, before Nylon was chosen. The first commercial use was for toothbrush bristles, which went on sale the same year. After World War II, nylon hosiery for women would make the Delaware chemical company a fortune. Learn more in Nylon, a Petroleum Polymer. The J. Paul Getty Museum art collection is housed at the Getty Center (above in 2009) and the Getty Villa on the Malibu coast. Following years of legal battle by his relatives, the J. Paul Getty Museum in Los Angeles became the most richly endowed museum in the world after receiving a $1.2 billion bequest left to it by oil billionaire J. Paul Getty, who died in 1976. After working in his father’s oilfields in Oklahoma, Getty founded his first oil company in Tulsa and drilled the Nancy Taylor No. 1 well near Haskell, where oil and natural gas production began in 1910. The J. Paul Getty Museum opened in 1954. His petroleum-based philanthropy enabled expansion of the art museum’s collections and creation of the Getty Conservation Institute, the Getty Research Institute, and the Getty Foundation,” notes the J. Paul Getty Trust. Halliburton’s 1921 cementing process isolated down-hole zones and helped prevent collapse of casing. Erle P. Halliburton patented his new oilfield technology – a “Method and Means for Cementing Oil Wells.” He had moved to the Healdton oilfield in Oklahoma after working in the booming Burkburnett oilfields of Texas. He established the New Method Oil Well Cementing Company in Duncan, Oklahoma, in 1919. 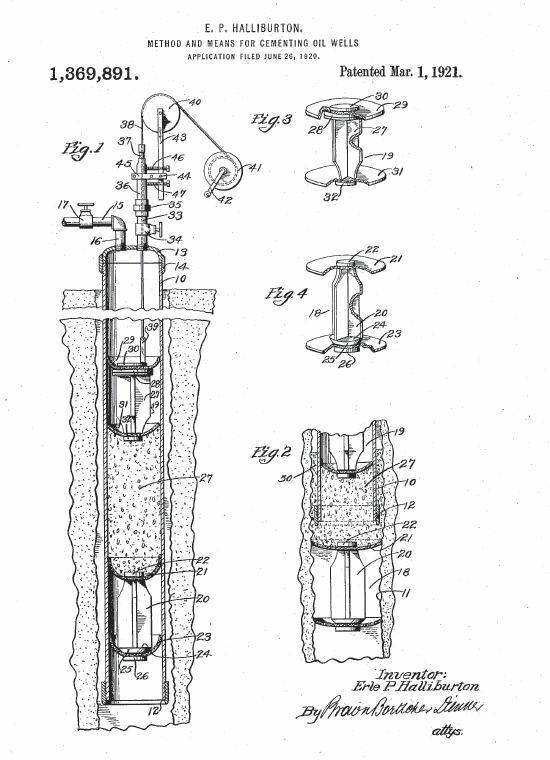 “It is well known to those skilled in the art of oil well drilling that one of the greatest obstacles to successful development of oil bearing sands has been the encountering of liquid mud water and the like during and after the process of drilling the wells,” Halliburton noted in his 1921 patent. The new well cementing process isolated the various down-hole zones, guarded against collapse of the casing and permitted control of the well throughout its producing life. It also protected the environment. Halliburton Oil Well Cementing Company and Stanolind Oil in March 1949 applied the first commercial application of hydraulic fracturing at a well near Duncan. Learn more in Halliburton cements Wells. Under the broad crown of a giant elm next to the Osage Council House in Pawhuska, Oklahoma, Skelly Oil and Phillips Petroleum Company jointly bid more than one million dollars for just a 160-acre tract of land. The 1922 auction was Oklahoma’s first million dollar mineral lease. Beneath the shade of the Million Dollar Elm, leading independent producers such as Frank Phillips, Harry Sinclair, Bill Skelly, Jean Paul Getty and E.W. Marland were frequent bidders to lease this promising territory on the Osage Indian Reservation. The Osage awarded a medal to their Million Dollar Auctioneer. The United States Geological Survey (USGS) was established when President Rutherford B. Hayes signed legislation that included a brief section creating a new agency in the Department of the Interior. The 1879 legislation resulted from a report by the National Academy of Sciences, which had been asked by Congress to provide a plan for surveying the territories of the United States. The new agency’s mission included “classification of the public lands, and examination of the geological structure, mineral resources, and products of the national domain,” notes a USGS history. Today based in Reston, Virginia, USGS has the largest earth sciences library in the world. Paola, Kansas, residents annually celebrate their town’s natural gas heritage of the late 1880s. By the end of 1887, several Kansas flour mills were fueled by natural gas. But with little understanding of conservation, Paola’s gas wells ran dry. Fortunately, more boom times arrive with oil discoveries. Learn more in Kansas Well reveals Mid-Continent. Recommended Reading: Enough for One Lifetime: Wallace Carothers, Inventor of Nylon (1996); As I See It: The Autobiography of J. Paul Getty (1976); Erle P. Halliburton, Genius with Cement (1959); The Underground Reservation: Osage Oil (1985); John Wesley Powell: Soldier, Explorer, Scientist (2006); History of Paola, Kansas (1956).